Why stop at 300 mph? For the first time ever, , and the reason is obvious: the Hennessey Venom F5 hypercar. First shown to the public at SEMA last November, the Venom F5 is now on display for an international audience only a few feet away from Koenigsegg, Hennessey’s new rival for the top speed production car world record. Also last November, it was a (an average calculated after two runs). Speaking with John Hennessey at Geneva, we can now officially confirm the Venom F5’s top speed goal: 311 mph (500 kmh). “I knew at some point somebody would beat our 270 mph (accomplished with the Venom GT in 2014). Bugatti Chiron was coming. but potentially 500 kmh. Our ultimate goal for the car is 311 mph (the equivelant of 500 kmh). I wanted under 3,000 lbs. A significant reduction in coefficient of drag from the Venom GT, which was 0.44 when it went around 270 mph. I wanted something significantly under 0.4. I’d be happy with mid-threes. We got it down to 0.33.” Impressive. With an expected 1,600 hp, the production-spec Venom F5 will be good to go for Pebble Beach next August. “We want the Venom F5 to be a decathlete. It can turn. It’s comfortable. It’s easy to drive around town. But like decathletes, it has its specialty. I want our F5’s best attribute to be straight line, all-out, absolute speed.” Limited to just 24 examples, 12 have already found buyers. Hennessey added there’ll be a 50:50 split between US and foreign buyers. But the Venom F5 can’t be bought by just anyone. “Nobody can just show up and say ‘Here, take my check.’ We’ve taken something like the Ford GT sales model where we take a prospective buyer's application,” Hennessey said. “We want to know about them. Know their background. What other cars do they have? Where do they live? What do they intend to do with the car? Collect it? Track it? We don’t want to deal with a middle man whose client is looking to flip it. 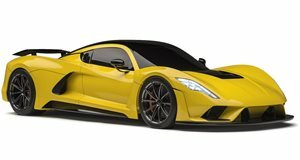 We want to know who the actual end user is.” The Venom F5 is a completely ground-up car, whereas the Venom GT utilized the tub and other components from the Lotus Exige. Hennessey added he first conceived of the entirely in-house F5 back in 2012, but it took him a few years to link up with the right design team. It was not until 2014 when the conversation got serious regarding the car’s exact make up. “My edict to the design team is that I wanted the ultimate performance car, with an emphasis on top speed,” Hennessey said. Cars like the just revealed McLaren Senna and upcoming Aston Martin Valkyrie certainly have their twisty track appeals, but straight line performance is Hennessey’s only goal for now, though we won’t rule out a future track-focused F5. We weren’t given a high speed test run timeframe, but we’re sure Hennessey will know when the time is right.